NETHER is a native Baltimorean street artist known for his wheat pastes, murals, and wall-mounted paintings depicting abstracted, monumental portraits of locals paired with cityscape imagery. NETHER’s distinct style is characterized by thick line work and color gradients, leading to strikingly simple narrative portraits. 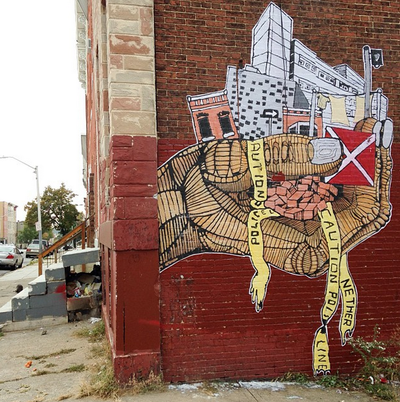 As curator and participating artist in Wall Hunters: Slumlord Project, NETHER advanced his socially-engaged practice by pairing street artists with vacant buildings and local community organizers. 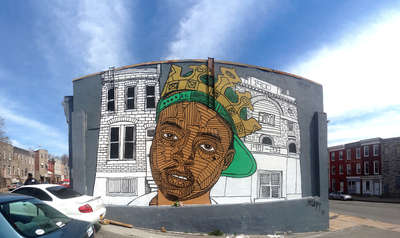 NETHER sees public art as a tool to call attention to vacant housing and community development. 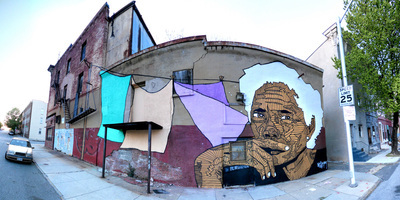 In addition to Wall Hunters, NETHER’s work has been installed in Baltimore, New York, Washington D.C., Philadelphia, Chicago, Berlin, London and Paris, and has been commissioned by Converse, the Baltimore Office for Promotion and the Arts (BOPA), and Grantmakers in the Arts (GIA) among many others. 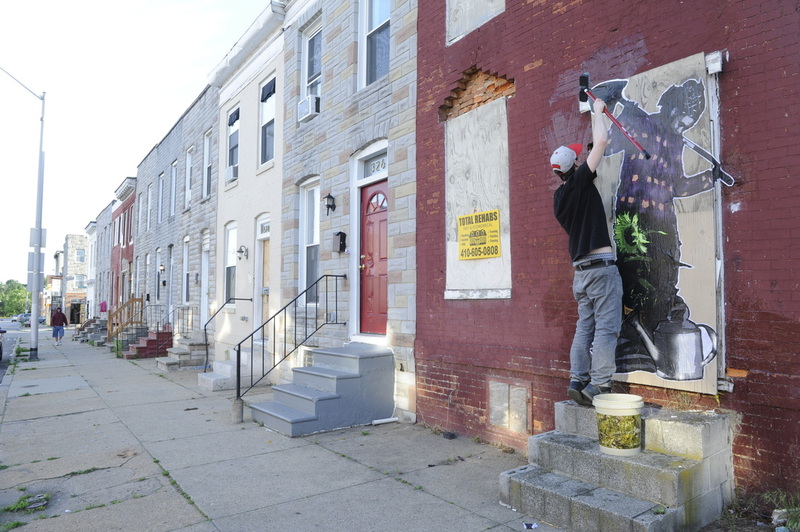 Tipping Point, a mural commissioned for LOCALLY SOURCED to be installed in the exhibition gallery, comments on the past few years of changes and developments in Greenmount West, Barclay, and Charles North—three neighborhoods that comprise the Station North Arts and Entertainment District. A developer’s unraveling master plan blocks visual representations of the past identities of the neighborhood, according to memories that longtime Station North residents shared with NETHER. 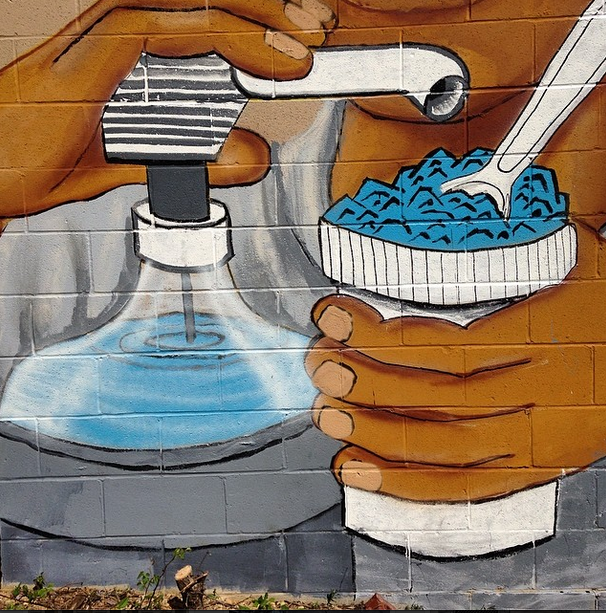 In the process of painting murals on the street, NETHER engages with passers-by, residents, and business owners both about the work and their lives. 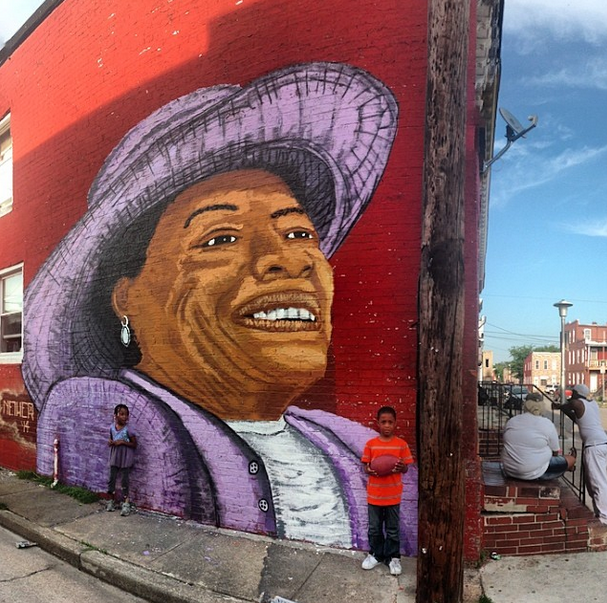 He has returned to many sites to create portrait murals of community members he has built relationships with, and in turn he has been commissioned to create murals outside of individuals’ homes and businesses. 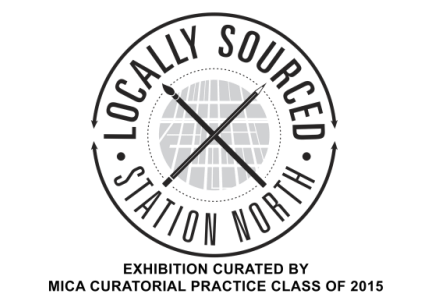 Station North has visibly changed over the past 10 years due to residential and commercial development bringing artist subsidized housing, working studios, chain and boutique restaurants, coffee houses, and mom-and-pop shops that weren’t here before. 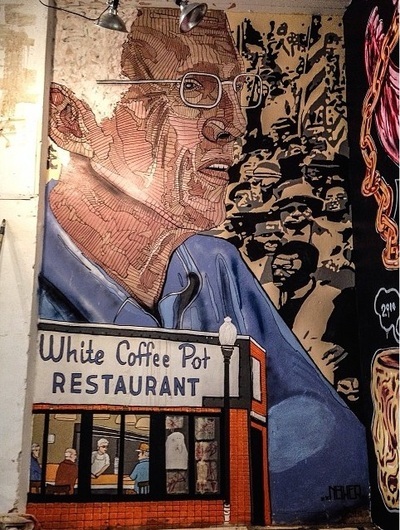 Tipping Point contrasts past and present, highlighting the cause and effect of development on the history, culture, businesses and residents of the Station North community.